“There will never be a cure for [human] diabetes”. The previous statement was made by a nice client I saw yesterday. I love when clients come in and the conversation just flows from topic to topic. Fortunately, I wasn’t super booked with appointments so I had time to chit chat about subjects beyond their pet. Anyhow, among other topics, we got to talking about human type 1 diabetes (her cat was drinking excessively so the conversation flowed from there). This client developed the disease at 6 years of age, within weeks of receiving a German measles vaccination. Three kids from her class developed Type 1 diabetes around the same time. She felt that the vaccine was to blame, which sent us on another discussion of the ethics and pitfalls of vaccinations. Like politics and religion, this topic is fraught with danger and controversy so I veered things back in the direction of the less precarious topic of diabetes. Allow me to digress for a second: I was in Kansas City at the Central Veterinary Conference a few weeks ago. I learned a lot and have collected a small pile of blog topics, including what I stumbled into with this client. Within the conference was another conference called the “Zoobiquitous Research” presentation. “Zoobiquity” is a term coined by Barbara Natterson-Horowitz, M.D. and Katherine Bowers in their book of the same title. I wrote about this topic in a 2011 blog article for Pet MD. In their words, “Zoobiquity” is defined as “the astonishing connection between human and animal health”. Essentially, humans and animals share the same disease conditions and M.D.’s and Veterinarians need to be research partners, sharing and collaborating information. Veterinarians in the audience are not surprised by this revelation, but the physicians are shocked. The physicians just hadn’t given it any thought. I find the topic of zoobiquity fascinating so I ponied up the $50 to sit with a bunch of human scientists (Who, interestingly, were all wearing suits. This struck me as odd because we vets tend to be of the more schlumpy non-suit variety, but that’s another blog topic) and see what’s happening in the world of Zoobiquitous research. One thing I learned, going back to my discussion with said client, was that there is a biotech company in Kansas City called Likarda that is working to cure diabetes. Lisa A. Stehno-Bittel, PT, PhD is the president and cofounder of Likarda and her lab has created these little blobs of tissue called “Kanslets™”. Basically they took a bunch of variably sized islet cells out of assorted pancreases, pureed them (the actual process by which they do this is top secret) into tiny pieces then stuck them back together in tiny little molds so that they are form into identical little uniformly sized “Kanslets”. Like tiny cellular Jell-o molds. “What does this have to do with diabetes?” asks the non-medical, possibly non-diabetic person? Islet cells are the cells in the pancreas that secrete insulin (insulin is the hormone that gets sugar into your cells for use as a fuel source. Without it, cells have to get fuel elsewhere and things get ugly). Islet cells don’t secrete insulin in cases of Type 1 diabetes (and some Type 2’s), which is why diabetics need insulin injections to make up the shortfall and manage their blood sugar levels. Anyhoo, if somebody could figure out how to successfully transplant healthy islet cells into a diabetic person (or pet) and have those cells survive and secrete insulin: Boom! Their diabetes is CURED. Not controlled. Not treated. Just CURED. These folks might just be on the hairy? 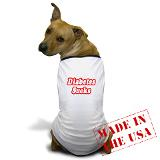 edge of curing diabetes in pets. There was a nagging question in my mind during Dr. Stehno-Bittel’s lecture. I’m very happy about this new technology for pets, it’s fantastic. However, won’t they be using this in people too? At the conclusion of her talk, she said the first question people ask her is mine. The answer is “no”. She said there were plenty of smart people working on islet cell transplants on the human side. They were sticking with pets. End of story. The answer felt a tiny bit evasive, but I took her at her word. Until that client I mentioned earlier got me thinking. What if Likarda is making islet cell transplantation a reality for just pets and not people because it’s just too hard to make it happen in humans? My client said there will never be a cure for human diabetes because the drug companies make way too much money from diabetes. A Multibillion dollar business. Glucometers, test strips, needles, syringes, insulin, medications. They don’t want to cure the disease, they profit more from the process of treating it. That gave me a little chill. Is this what we’ve come to? I mean, if I really want to wallow around in cynicism I can see she has a very valid point. I hate to think that, but what is the last disease you can think of actually being “cured”? We have scads of pills and treatments and preventatives, but how many cures? Ugh, I don’t want to go there. Hopefully the researchers will get this all figured out on our pets. Clear up their diabetes so that then, maybe, somebody will figure out how to take care of all those diabetic humans. Because the alternative: the possibility that pharmaceutical companies are standing in the way of curing disease… well that just makes me sick. Wish I had known you were so close by. I would have bought you a cup of coffee. Second, it’s unimaginable that if a true cure is possible – especially for children – that it would be withheld from the public. However, I confess I’ve often wondered if someone found a cure for the common cold, would it be hidden due to the massive amounts of money spent on over-the-counter medication. Lol I didn’t even consider non veterinary folk would crash our meetings. That’s funny! Sadly, they still have those hard copies. People walking around carrying those phone books! It was kinda funny when I’d run into vet professionals I know. They’d look really surprised then kind of snicker into the back of their hand. P.S. Adding another comment because I neglected to select the “notify me of follow-up comments”. I had an Endocrinologist at Mayo Clinic tell me that there are fewer dollars that go toward endocrine studies versus heart research and other more deadly disease. The mindset being to cure the more serious conditions first versus ones that can be controlled. It seems something like this might be more apt to come out of a medical school or research hospital versus a corporation. With the economy in distress since 2008, I am sure there are less grants being given which could have a bearing as well. Although there are cases where pharmaceutical companies are negligent like when they put a drug out there that harms people, it concerns me that we get too far away from a free market system in this country. I am sure there would be mountains of regulation to sift through if they did come up with a cure. There should be controls to be sure drugs and cures are safe. From a corporate perspective, the legal challenges might be so great that it negates any profit. In regard to your comment about collaboration between animals and mankind, I had total thyroid failure almost 20 years ago and thankfully I have benefited from animal science. I take Synthroid which is almost like human thyroid. I am so pleased that my presentation at the KC CVC sparked these interesting conversations. I know that we all want a cure for type 1 diabetes for pets and humans alike. Here is the major point of my presentation….. islet transplants have been offered to HUMANS with type 1 diabetes since the year 2000. Much of the preclinical research that went into approval of islet transplants for humans was done successfully on dogs. Yet, the procedure (currently offered to humans) has never been offered to dogs as a therapeutic intervention. That is why Likarda is focused on bringing this currently-available human intervention to the pet world. In doing so, we hope that what we learn in treating our pets can also result in improvements to humans with type 1 diabetes. Thanks so much for your comment. It was a great lecture on an exciting topic. I look forward to hearing more about Likarda in the future.